Pallet bracket has fixed on the backside of the pallet, it make sure the pallet to move within 15cm in the horizontal direction. 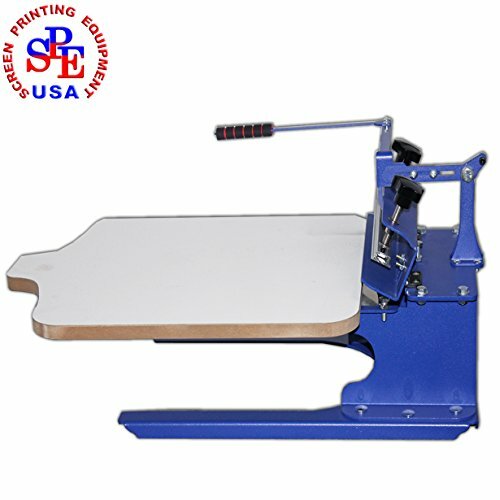 This machine is specially designed for one color T-shirt screen printing because of its dedicated T-shirt pallet which can guarantee the accurate positioning and good printing effect. It can also be applied to printing on substrates which need overprinting, such as pillowcase, bag, non-woven bags and so on. The user can only change the pallet according to the substrates to satisfy the needs of different kinds of printing and it is easy to dismantle the pallet. Using the lever principle to control the handgrip, lift up the screen frame and hook it. Adjusting the adapting piece to lift up the screen frame at a angle of 30-45 degree. Put up the handgrip will lay down the screen frame. The handgrip could be moved with 5.5" (14cm) in the horizontal direction, suitable for the screen frames which size is less than 23.6" (60cm). If you have any questions about this product by Screen Printing Machine Series, contact us by completing and submitting the form below. If you are looking for a specif part number, please include it with your message.